You want to know more about Elsa Fracture Surgery? 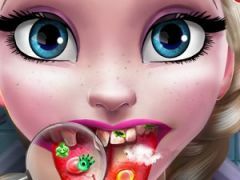 It's time for you girls to try our latest added doctor game called Elsa Fracture Surgery, a beautiful new Frozen doctor game we've specially added on our site gamesonlinekids.com mainly for your entertainment, dearest Frozen fans, and we truly recommend you to try out this fun new game Elsa Fracture Surgery. Elsa was walking through her stunning Frozen castle, and she fell off the stairs getting a terrible hand injury, actually, she has a fracture at her hand which you girls will have to take care. Act as a real doctor in this game Elsa Fracture Surgery, and prepare Elsa for her hand surgery, use the scalpel to see the fracture and fix it, then stitch the cut you made and after three months, once Elsa is fully recovered, you girls will get to dress her up in a wonderful outfit, a cute new dress, a new hairstyle, lovely shoes and other accessories such as earrings, necklaces and purses. We know that you girls will have a blast playing Elsa Fracture Surgery, and we must recommend you to stay tuned within our site gamesonlinekids.com for more exciting games to play! You want to find more about Elsa Fracture Surgery? The Elsa Fracture Surgery game has part from Frozen Games. This game is played by 13 times, have 1 votes (1 likes and 0 dislikes) and his added 15 April 2019.